To mark the 700th jubilee of the town of Waldenbuch in the year 1996, the "Waldenbuche" statue was erected as a special attraction for the occasion of the "Veitsmarkt"* (St. Vitus' Market). The Waldenbuch artist Rolf Weinhardt created the sculpture, which symbolises a tree, out of metal tubes. Visitors to the Veitsmarkt could immortalise themselves on a triangular leaf with their name and a year chosen from the past 700. 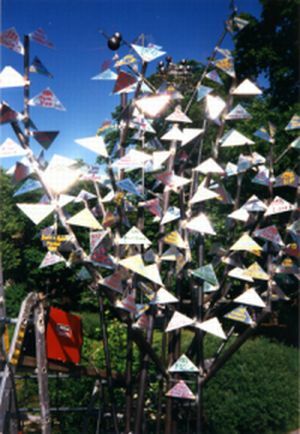 The leaves were welded to the tree on site, thus "foliating" the sculpture, which was presented to the town by the organisers of this performance art event, the Kunstfreunde Waldenbuch & Steinenbronn. *The Veitsmarkt was a market held in previous centuries to celebrate the Feast of St. Vitus. Sometime in the past, Waldenbuch was granted the right to hold a fair on this day, 15th June. The Veitsmarkt was revived for the occasion of Waldenbuch's 700th jubilee.